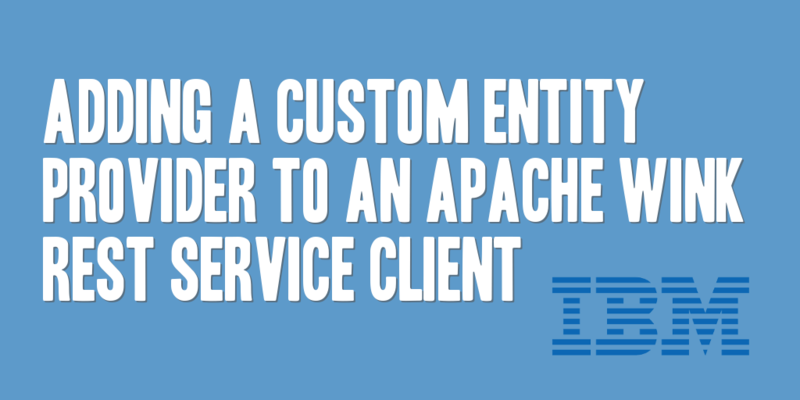 When creating an Apache Wink REST service client in WebSphere Commerce v7.0 it is possible to use a custom entity provider with your REST service client allowing you to map a Java object to the service request and response. NOTE: This post will build upon a previous post, Creating a REST Service Client in WebSphere Commerce v7.0 with Apache Wink, and will discuss how to add a custom entity provider to your REST service client. To begin adding a custom entity provider to your Apache Wink REST service client, you first need to create a class that will implement one or both of the following interfaces to facilitate the conversion to and from a Java object. The sample class shown below will take a JSON response from a REST service and convert it into a Java object. For purposes of simplicity, I’ve only shown the MessageBodyReader implementation. This example shows a JSON object containing a single element (“ResultCode”) being transformed into a Java object of type CustomEntityResponse, containing a similarly named resultCode field. Now to leverage the CustomEntityProvider class just created in the Apache Wink REST client, add an Application object, consisting of a Set containing the CustomEntityProvider Class object to your Apache Wink ClientConfig object. When pulling your response from the ClientResponse object, you’ll need to modify your code to pull the appropriate CustomEntityResponse object you created earlier. That’s it! Assuming you’ve properly implemented your Apache Wink REST service client, you should now be able to pull and retrieve your CustomEntityResponse object from your ClientResponse object!